Pianos | David Baron Music | The Official Site of Singer/Songwriter David Baron. 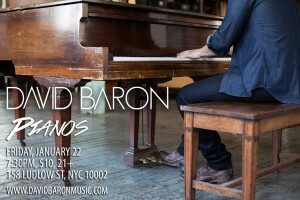 Address : 158 Ludlow St.
On Friday, January 22, singer-songwriter David Baron will take the stage for a full-band show at Pianos in Manhattan’s lower east side. The show will feature performances of songs from Baron’s latest full-length album of all original material, Heartbeat, as well as old favorites. The concert begins at 7:30pm, tickets are $10 for ages 21 and over, and are available at the door and online at http://www.ticketweb.com/t3/sale/SaleEventDetail?eventId=6366085&pl=pianosnyc&dispatch=loadSelectionData. For more information, visit http://www.pianosnyc.com/.